To start the evening off, men’s soccer head coach Ian Skitch took the stage to share the successes of his team that earned an ACAC silver medal this past fall. Samuel Kohan was presented with Leadership Award while Michael Mis was honored with the All Heart Award. 3rd year defender Kenny Johnson was recognized with the Outstanding Scholastic Student Athlete award and was named the team’s Most Valuable Player. Robbie Valpreda and the Thunder women’s basketball team began their awards program by honouring 1st year guard Els Hryniw with the team Leadership award and Outstanding Scholastic Student Athlete award. Amy Van Brabant had an excellent season as a first year forward and was recognized with the All Heard Award. 5th year guard Morgan Dool was presented as the team’s Most Valuable Player. After a dominant season leading the ACAC north conference and earning a ACAC silver medal, Reagan Wood and the men’s basketball team took to the stage for their awards presentation. In addition to being an Outstanding Scholastic Student Athlete, 2nd year shooting guard Keaton Souster was also recognized with the team Leadership Award. 4th year centre, Ronald Bacon Jr. earned the team All Heart Award while 5th year forward Ryan McLaren was named the team’s Most Valuable Player. 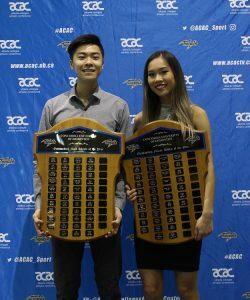 After taking the throne as ACAC Team Champions from the NAIT Ooks, head coach Kevin MacAlpine had many highlights to talk about as the Thunder badminton had an incredible season. Kassidy Turcotte who is in her 4th year with the Thunder, was presented with the Team Leadership award. 1st year athlete, Kennedy Turcotte, was named All Heart while Takeisha Wang and Kaylee Morris shared the honours of Outstanding Scholastic Athletes. Desmond Wang was the team’s Most Valuable Athlete. Coach MacAlpine remained on stage as the golf team was up next to join him. The golf team also had a great season as they picked up a combine two bronze and a silver between the men’s women’s and mixed divisionsat the ACAC Champiosnhips. 4th year golfer Kassidy Turcotte earned the team Leadership Award while her sister Kennedy was presented with the All Heart Award. 1st year golfer Riley Higdon was the teams Outstanding Scholastic Athlete and Nicolas Pittman was awarded the team’s Most Valuable Player.